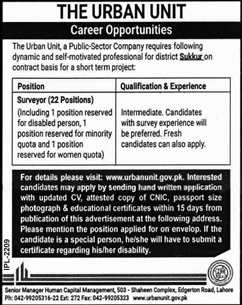 the Urban Unit a Public sector requires following dynamic and self-motivated professional for district Sukkur on contract basis for a short terms project. Punjab Government Urban Unit Jobs 2019 for Surveyor has been posted on express newspaper on 13 March 2019. Punjab citizen unit is looking forward to filling out vacancies of some positions. The urban unit is looking for professionals who are well experienced in their education. Intermediate, Candidates with survey experience will be preferred and fresh candidate also apply. 22 positions are announced by Punjab Government Urban Unit. Interested candidates may apply by sending handwritten application with updates CV, attested copy of CNIC, passport size photo and all educational certificates at the following address.